In the last couple years, many touchscreen devices have been produced on mobile devices. The growing popularity of these devices has sparked debate to crown the superior touchscreen technology. 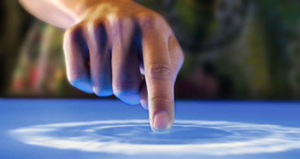 We’ll run down the two most popular touchscreen technologies: resistive and capacitive. Resistive touchscreens are usually developed with two layers of electrically conductive material that are separated by a thin layer of space. 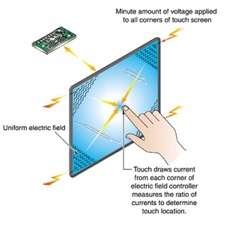 An electrical current is sent through the layers, and input is registered when the two screens touch. Because the outside layer needs to be flexible enough to bend towards the internal layer, plastic is often used as the exposed layer. Plastic screens are more vulnerable to scratches and can gradually wear out, requiring it to be recalibrated. The use of plastic prevents the major damage of a drop had glass been used. Due to the extra layers used in resistive screens, less light shines from the device’s screen. Resistive screens are usually harder to read outside because the extra layer reflects sunlight. stores an electrical charge. When touched, some of the charge is transferred to the user and input is registered where the electrical charge decreases. Glass is commonly used for the sole layer, which is less prone to scratches but easily damaged during a fall. Because of the materials and sensors used, capacitive touchscreens are most costly to produce than resistive. Because there is only one layer (usually glass), light can easily pass through both ways for easy visibility, even in sunlight. 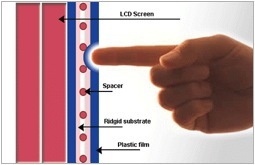 Resistive touchscreens require pressure for the two layers to make contact while capacitive screens activate at the slightest contact with the user’s finger. While capacitive screens are very accurate, it can be hard to precisely select an item on the screen due to the size of your finger. A stylus is sometimes used on resistive screens for character and handwriting recognition. Most resistive screens do not support multitouch, but some companies have already researched and produced multitouch resistive touchscreens. Which is better? They both have their strengths and weaknesses. From what I’ve seen, capacitive screens take less effort and are generally more responsive. Resistive technologies are still advancing and from demos making their rounds, neither will be disappearing anytime soon.